As one of the oldest known gems, pearls have been considered the most valuable of gems for centuries. Actually, pearls are gems like none other. They are derived from a living creatures, mollusks, and are essentially organic matter. 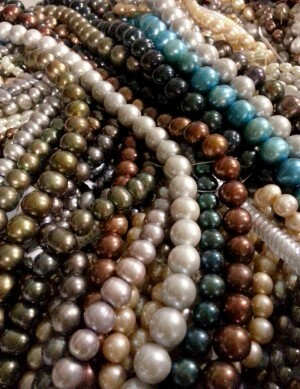 Because they are so old and precious, pearls are surrounded by traditions and have been used as adornment for centuries. Pearls become tuned to the phases of the moon. Astrologically they link to the moon. Pearls are sometimes called tear drops of the moon. Other folklore tales say that pearls were born as the heart of oysters when a single rain drop fell from heaven and touched it. Others believed that pearls were formed by when angels passed through heavenly clouds. We even read that pearls were the tears of mermaids! I love that! What we do know is they are beautiful and are said to bestow the wearer with good will and positive, uplifting feallings! Can’t beat that! Come see the treasures this weekend!